Teuku Umar. He was born in 1854 (the date and month are not recorded) in Meulaboh, West Aceh, Indonesia. He is a national hero who had led the guerrilla war in Aceh since 1873 until 1899. 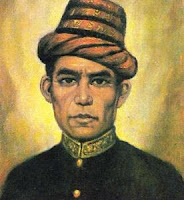 Teuku Umar's grandfather was a descendant of Minangkabau, namely Datuk Sati Makdum who have contributed to the Sultan of Aceh. Makdum Datuk Sati had two sons, namely Nantan Faithful and Ahmad Mahmud. Teuku Ahmad Mahmud is the father Teuku Umar. When the Acehnese war erupted in 1873 Teuku Umar participated fighters fought alongside other Aceh, and he's still menginjak19 year. At first he struggled in his own village who then dilanjukan to West Aceh. At this age, Teuku Umar also been appointed as keuchik (village head) in Meulaboh Power. Teuku Umar since childhood personality known as a smart, brave, and sometimes likes to pick fights with their peers. It also has properties of a hard and unyielding in the face of all the problems. Teuku Umar never landed a formal education. Nevertheless, he was able to become a strong leader, intelligent, and courageous. Teuku Umar Marriage is not all done. When age was the age of 20 years, Teuku Umar married Nyak Sofiah, children uleebalang Glumpang. To increase the degree itself, Teuku Umar then got married again with Malighai Nyak, daughter of Commander Sagi Mukim XXV. Since then, he began using his Lil. In 1880, married the widow of Umar Teuku Cut Nyak Dien, the daughter of his uncle. Cut Nyak Dien actually already has a husband (Lil Ibrahim Lamnga) but passed away in June 1978 in the war against the Dutch in the GLE Tarun. After that, Cut Nyak Dien met and fell in love with Teuku Umar. Both then fought together launched an attack on the Dutch outposts in Krueng. The results of his second marriage was a daughter named Cut Gambang who was born in refugee camps because their parents are struggling in the field of battle. Dutch troops had come to terms with Teuku Umar in 1883. One year later (in 1884) war broke out again between the two. In 1893, Teuku Umar then find a strategy on how he was able to obtain weapons from the enemy (the Netherlands). Finally, Teuku Umar pretending to be a stooge (accomplices) the Netherlands. His wife, Cut Nyak Dien ever got confused, embarrassed, and angry at her husband's decision. Governor Van Teijn at that time also intend to use the Teuku Umar as a way to win the hearts of the people of Aceh. Teuku Umar then entered military service. Involvement, on January 1, 1894, Teuku Umar was awarded the title Hero of Johan and allowed to form its own army legium numbering 250 soldiers with weapons. When joined with the Dutch, Teuku Umar was never subdue Aceh defense outposts. Teuku Umar carried out the war in an act. Because, before Teuku Umar has notified in advance to the fighters in Aceh. As compensation for his success, Teuku Umar request to add 17 people captains and 120 soldiers, including a right hand end Pangleot as granted by the governor to replace Governor Deykerhorf Ban Teijn. On March 30, 1896, Teuku Umar then out of the Dutch army to bring his troops together with 800 guns, 25,000 rounds of ammunition, 500 pounds of ammunition, and cash 18 000 dollars. With the growing strength, Teuku Umar along with 15 people turned back to defend the people of Aceh. Finesse and a very astute strategy of war was intended to deceive the Dutch forces at that time a very strong and very difficult to overcome. At that time, the struggle Teuku Umar received support from Lil Commander Mohammed Daud Polem that 400 people came together to face the Dutch attack. In the fighting, as many as 25 people were killed and 190 wounded in the Netherlands. Governor Deykerhorf feel offended by the tactics that made Teuku Umar. Van Heutsz ordered to deploy massive forces to capture the Teuku Umar. Sudden attack to the Melaboh cause Teuku Umar was shot and killed in the battlefield, which is in Kampung mugo, inland tanggal10 Meulaboh on February 1899. Since childhood, Teuku Umar actually have thoughts that are often difficult to understand by his friends. When growing up was thinking also remains elusive. As has been reviewed above that the tactics Teuku Umar who pretends to be a stooge Netherlands is as a form of "complexity" of thought within him. Various commentators appear to understand Teuku Umar thought about tactics such pretense. However, certain that the tactics and strategies considered to be very accurate in the face of the onslaught of Dutch colonial troops and weapons that have very complete. Teuku Umar saw that the "negative way" one should not do so long as to achieve "positive goal". If traced in the context of contemporary thought, thinking that it sounds closer to communism, which also justifies any means. Teuku Umar fighting spirit in the face of Dutch colonialism, which in turn encourages such thinking. Teuku Umar's work can be a success in the face of the enemy himself. For example, on June 14, 1886, Teuku Umar Centon Hok had attacked the ship, owned by the Dutch. The ship was overrun by the forces Teuku Umar. Ship captain, Hans (from Denmark) were killed and the ship turned over to the Netherlands to ask for a ransom of 25,000 ringgit. Courage is greatly admired by the people of Aceh. Other work is a success Teuku Umar when a lot of weapons as a result of his treachery towards the Netherlands. Based on Presidential Decree. 087/TK/1973 on 6 November 1973, Teuku Umar was awarded the title of National Hero. Teuku Umar's name is also immortalized as the name of the street in some parts of the country, one of which is located in the famous Menteng, Central Jakarta. In addition, his name is also immortalized as the name of a field in Meulaboh, West Aceh.